Please plan to attend Sunday School and Morning Worship on November 5th for this very special visit from our missionaries. 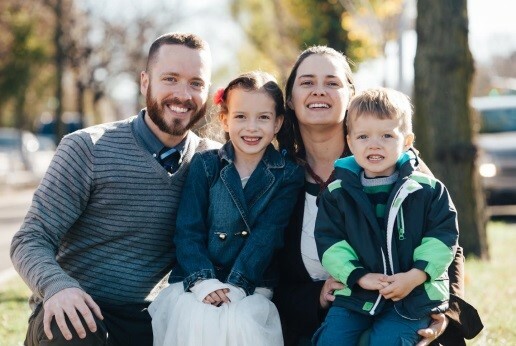 Robert and Joanna Walter are missionaries to the Jewish people serving with Chosen People Ministries in Brooklyn, NY. While neither one of them is Jewish, God laid a heavy burden on their hearts to share Jesus with His chosen people. Robert grew up in a secular home in New Jersey and came to faith in Jesus at the age of 19. As he grew in his faith, he began to sense God’s calling to ministry and eventually Jewish ministry in particular. In the summer of 2004, two young men came into Robert’s life. One was a strong Christian who was overflowing with excitement about his newfound appreciation for the Jewish roots of his faith. The other was an Orthodox Jew who had come to the realization that Jesus was his Messiah. As Robert spent more time with each of these young men, the Lord’s plan began to unfold. Looking back, Robert reflects, “I can see now how God was showing me the fruits of a ministry that would become my life’s pursuit, bringing the Gospel of Jesus to the Jewish people, and sharing the Jewish roots of our faith with Christians.” Robert enrolled at Palm Beach Atlantic University and became very involved with Chosen People Ministries’ congregation and outreaches in the South Florida area. It was here that his relationship with the Mission began, as well as his relationship with Joanna. The two were married in 2007 and came on staff with Chosen People Ministries the same year. The couple moved to Brooklyn with their two small children in 2010. Robert completed his seminary studies at the Charles Feinberg Center for Messianic Jewish Studies in 2013 and now serves as a congregational leader, the director of Chosen People Ministries Brooklyn branch, and teaches first year Greek at the seminary.